I’ll never forget the day when I was in college. I was standing in line waiting to buy textbooks for the new school year. Then, when I got to the cashier to pay for my books, my debit card declined. I didn’t have enough money in my bank account to pay for my books. I couldn’t believe it. Where did all my money go? That day, I made a promise to myself to never let this happen again. I wish I could say the change happened overnight, but it didn’t. It took time to identify my spending triggers and develop a healthy relationship with money. I slipped several times along my journey towards improving my finances. But instead of giving up, I always chose to get back on track and learn from my mistakes. Just a few years ago, I struggled to save money. And now… I have over six-figures worth of savings. The biggest change which helped me grow my savings was to improve my spending habits. Developing smart spending habits can make your money go further. While increasing your income can help you save money faster, it won’t do you any good if you have bad spending habits. 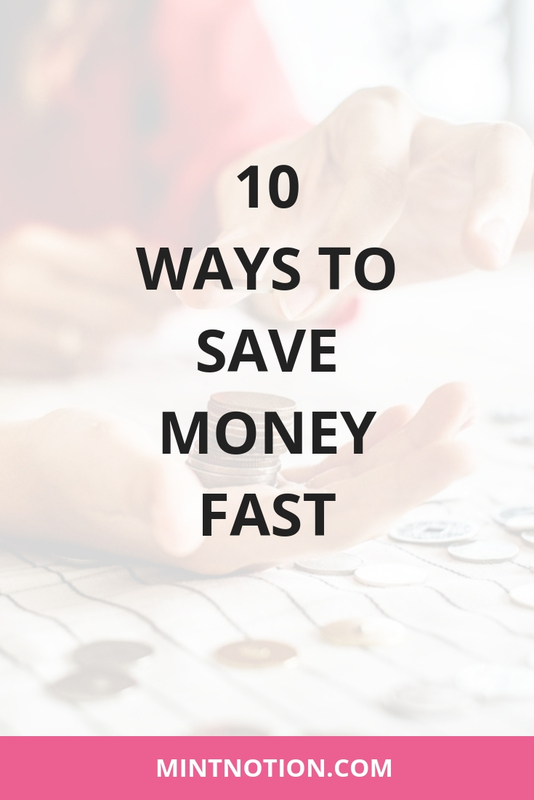 Today I’m sharing 10 ways you can change your spending habits so you can save money faster. What does delaying gratification mean? I know creating a budget sounds boring, but it’s the BEST way to change your spending habits. Why? Because budgeting is simply the process of creating a plan to spend and save your money. Without a spending plan in place, it’s going to be hard to improve your spending habits and reach your goals, such as paying off debt. When you create a spending plan, this lets you know in advance whether you’ll have enough money to do the thing you need or want to do. 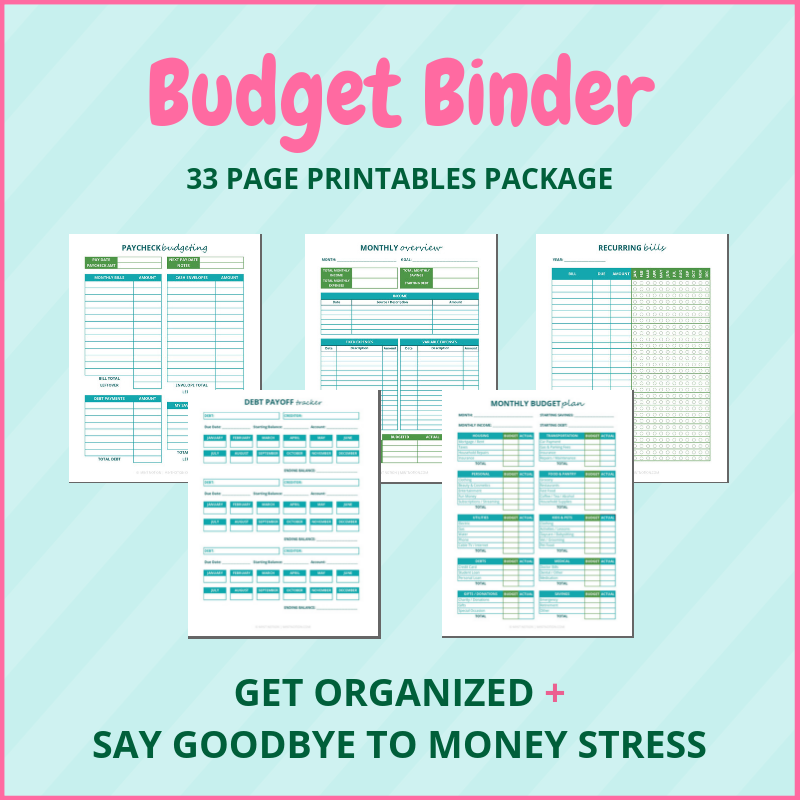 To start your budget, you can download a copy of my 2019 Budget Binder Printables here. 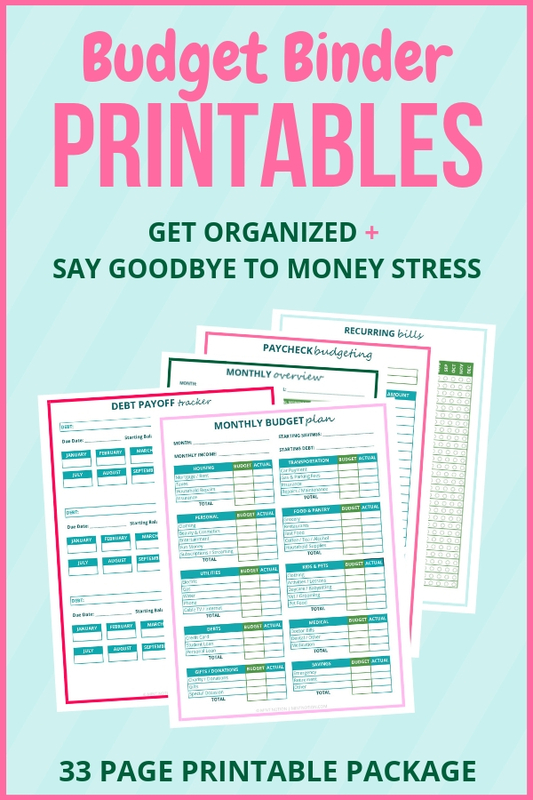 It’s available for purchase, or you can create your own budgeting worksheets. New to budgeting? No worries. 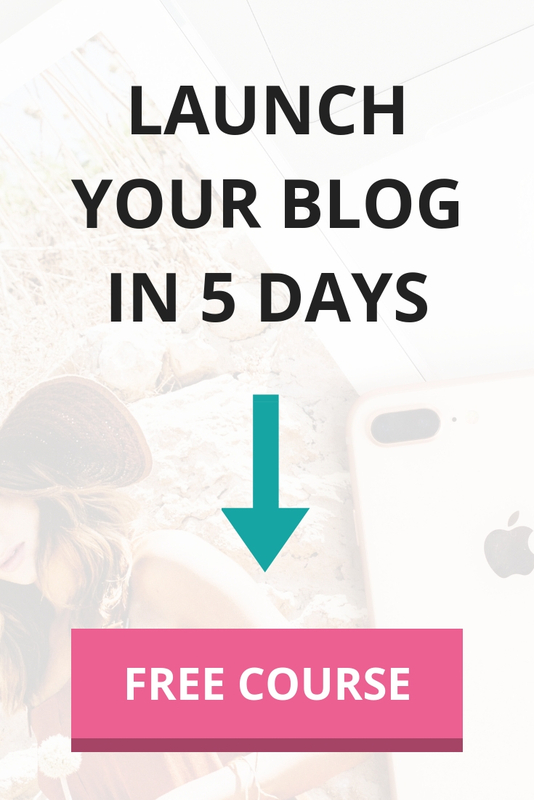 You can follow my step-by-step guide here to help you create a budget and stick to it. Creating a realistic budget is the first step in taking action towards changing your spending habits. If you want your budget to work though, you’ll need to track your spending. This is the best way to determine if you’re actually sticking to your spending plan. You can use an app to track your spending, but I like to keep it simple and write everything down on paper. This is what my mom did to keep track of my family’s spending when I was growing up and it’s how she taught me. I use my Tracking Expenses worksheet to do this, which you can download here in my 2019 Budget Binder. It creates financial awareness. 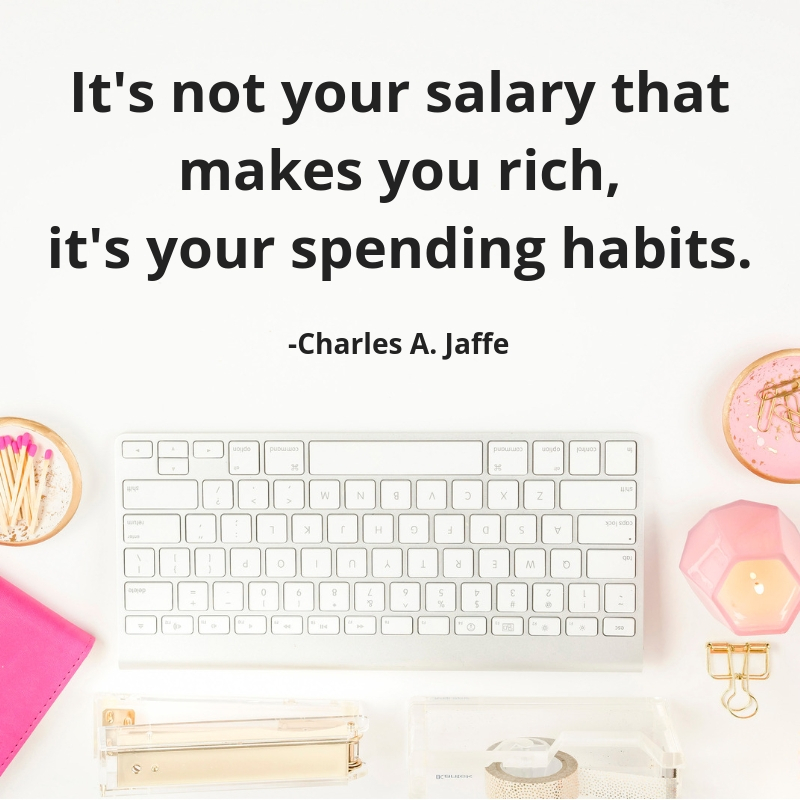 If you don’t know where your money is going, you won’t know which spending habits to change in order to make your money work for you. The best way to get ahead is to spend less than you earn and live below your means. It identifies spending issues. Tracking your spending can help you see if your current spending matches your priorities. If you’re having trouble reaching your financial goals because you’re spending $100 every weekend eating out and shopping with friends, it’s going to be easier to understand where you need to make spending adjustments. You’ll feel less anxious about money. How do you feel when you look at your bank account? Most of us avoid talking about money because we feel uncomfortable. Taking ownership of your finances and facing them head-on can help reduce stress and anxiety. Read Next: Is your money mindset keeping you poor? Now that you’ve created a budget (a plan to spend and save your money) and gotten into the habit of tracking your spending, the next step is to practice delaying gratification. Delaying gratification is one of the hardest action steps you MUST take to improve your spending habits. Especially in today’s world of “buy now and figure out a way to pay for it later”. This is one of the main reasons why consumer debt is at an all-time high. Delaying gratification means making a choice which limits the ability to get something now, so we can have something better later. It’s about having self-control and self-discipline. However, our culture encourages us to find “band-aid” solutions instead of delaying gratification, so we can avoid pain in the moment. This includes gambling, get rich quick schemes, fast weight loss trends, and the need to always have to latest tech gadgets instead of saving for retirement. Create a clearly defined vision for your ideal future. Knowing what you want to achieve long-term can help you delay gratification so you can reach your ultimate goal. What does your personal life / health / finances / career mean to you? What is your ideal vision for your personal life / health / finances / career? What words comes to mind when you think of each area? Whenever I want something new, I force myself to wait a certain amount of time before buying it. For example, if I want a new pair of sneakers, I’ll write it down in my notepad with today’s date. Then I’ll force myself to wait 6 months before buying the sneakers. After 6 months has passed, I usually don’t feel the urge to buy the item anymore. This is a win for me because I save money! If 6 months seems too long to wait, try it for a week (or one month). By forcing yourself to wait before making a purchase, this helps train your mind to control your emotions and stop frivolous spending. All work and no play will make you feel miserable. Your ultimate goal may take months, years, or even decades to achieve. This is why it’s important to reward yourself along the way. For example, when I was saving money to pay for graduate school, I cut back on eating out by packing a homemade lunch. To reward myself, I would give myself permission to eat lunch at my favorite sushi restaurant once per month. By changing my spending habits, I was able to see my savings grow, and reward myself without feeling guilty. One thing I noticed on my journey toward improving my finances was that I was spending money on things that weren’t important to me. For example, I used to grab a tea every morning from a local café on my way to work. Even though I could easily make tea at my office, it was just a habit to go to the local café each morning. 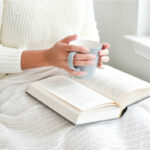 Once I realized this habit was costing me over $600 per year, it was easy to switch to making tea at work instead. Determine which expenses are not important to you and find a way to reduce or eliminate these expenses. Maybe you’re paying for a gym membership you rarely use. Or maybe you’re paying for an premium cable TV package, even though you don’t watch all the channels. Or maybe you’re buying brand name food products at the store, even though the generic brand tastes just as good (and is a lot cheaper). PRO TIP: If an expense is important to you, such as getting coffee out every morning, that’s no problem. I’m not suggesting you cut out this expense. Instead, reduce or eliminate another expense that’s LESS important to you, so you can afford to get coffee out each morning. Planning ahead can prevent impulse and unnecessary spending. For example, I always keep a granola bar in my purse. So if I’m running errands and get hungry, I can satisfy my hunger with a granola bar until I get home, instead of paying $10 to eat out. Another way to plan ahead is to keep a finance calendar. Here you can keep track of upcoming birthdays, events, holidays, vacations, and so on. Many people forget to include these costs in their budget, which can lead to poor spending habits. You can download a copy of the finance calendar worksheet I use here. It’s available for purchase in my 2019 Budget Binder or you can create your own calendar. I also recommend setting aside money each month for emergencies. Having an emergency fund can help prepare you for those unexpected events in life you can’t plan for. Without an emergency fund, people often go into debt to pay for those surprise expenses, such as car troubles. As you can see, planning ahead is prevention. It can improve your spending habits, help you stick to your budget, reduce stress, and save you time. You are the average of the 5 people you spend the most time with. Many of you already know this quote, but it’s hard to apply this advice. As a general rule, never take advice from someone you wouldn’t trade places with. The 90’s beanie baby craze started my interest in collecting things. First it was beanie babies, then it was books, Pokemon cards, CDs, DVDs, clothes, handbags, and so on. Many of these things didn’t appreciate in value like I thought they would. Now when I think about much money and time I spent on my collections, it seems very wasteful. It was just sentimental items which created clutter. I’m not saying it’s bad to collect things. Collecting things you love can make you feel good. 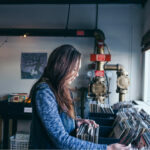 However, if collecting things is taking away time and money that could go towards reaching your financial goals, you may want to consider adjusting your priorities. For example, I used to love collecting books. I dreamed of having my own library (like in the Beauty & the Beast movie). This collection was costing me a lot of money and time. I even had to buy storage bins to organize my books because I was running out of space to store them. When I downsized and moved to my apartment last year, this forced me to decide if my book collection was improving my finances and life. I sold many of my books because I rarely re-read them. Now I have less clutter and I can focus my time on income-generating activities. Try to limit contact with these spending triggers, so you can stick to your budget. The best way for me to learn more about my spending triggers was to do the no new clothing challenge. I used to be addicted to shopping and struggled for years to cut back. The no new clothing challenge made me more aware of my spending triggers so I could get a better handle on my finances. Did you just get a bonus or a pay raise at work? Congratulations! Did you receive money for your birthday? That’s awesome! Now pretend that extra money doesn’t exist. Instead of spending this surprise cash on a fun night out or a shopping spree, put that money to good use. Apply it to your savings plan, paying off student loans, paying off debt, your emergency fund, and so on. This is another way to delay gratification. 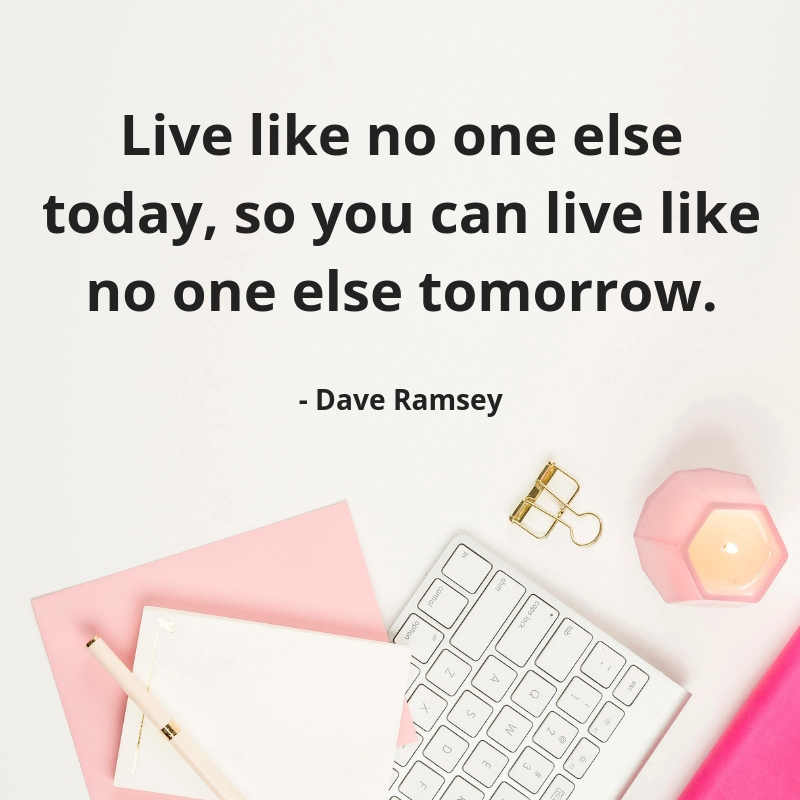 You can enjoy your bonus cheque today, or you can put it towards reaching your financial goals faster and achieving something bigger tomorrow. This is the last point on the list, but it’s one of the MOST important ways to change your spending habits. No matter how much or how little you earn, it’s vital for you to find ways to increase your income. You should never rely on just one source of income. Job loss can happen. Pay cuts can happen. Bonus cuts can happen. It’s important to be prepared. Wealthy people have multiple sources of income. They don’t focus on saving money alone. They know the best way to reach their financial goals is to grow their income AND save money. There are many ways to make extra money. Whether it’s getting more paid hours at your current job, negotiating a pay raise, finding a higher-paying job, starting your own business, or getting a side hustle. You can start a blog like this or drive for Uber or rent out your space on Airbnb. There are lots of great ways to increase your income. Changing your spending habits can help you save more money. By following these 10 tips, you can grow your savings faster. I was never a “natural” at saving money. 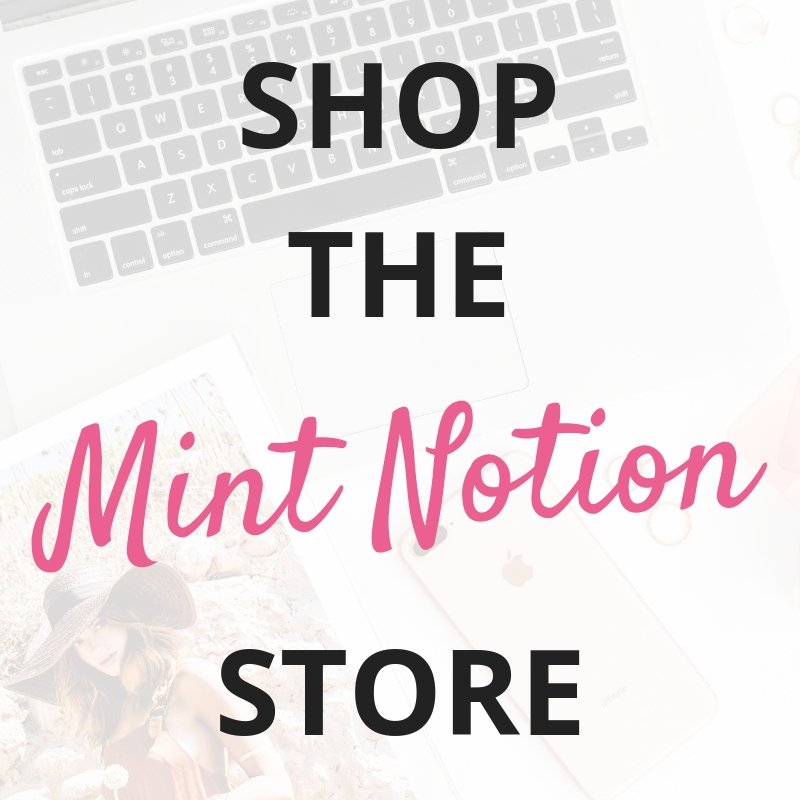 It took TONS of practice and the conscious choice to work on changing my spending habits one step at a time. 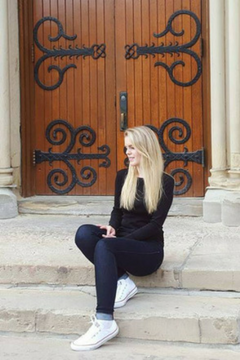 This isn’t about being 100% perfect all the time. We all mess up. The trick is to shake it off and get back on the right track. You need to work relentlessly toward reaching your financial goals. You’ve got this!